Soft and chewy with a crisp, buttery edge, the whole wheat flour adds extra flavor. My first experience with lambing, back in 1996, was quite an adventure, especially since I had never before witnessed anything being born. A big, black-faced Suffolk named Sophie was the first of my ewes to give birth. And she had quadruplets. Which is extremely rare in sheep circles. Two of the lambs didn't survive, but this is not uncommon. The two that did had black heads, black legs, and white bodies covered with darling little black spots. Curled up together, they looked like two scoops of chocolate chip ice cream, and I immediately started calling them Chip and Chip, or The Chippers. This was nine years ago, and Chip and Chip are doing just fine. The Chippers are boys, and unless one is in need of a ram, all male lambs on a farm are routinely castrated when they are very young. They are then called wethers. Wethers are fattened up and eventually relocated into somebody's freezer. Except the lucky few like Chip and Chip. They were cute and sweet and cuddly and the first lambs born on the farm! I refused to rename them Chop and Chop. Their chocolate chip spots faded, and they became big, wooly pets. One is bigger and woolier than the other, so they are referred to as Big Chip and Skinny Chip, though both of them are huge. Since the days of raising large flocks of wethers solely for their wool have long since passed, The Chippers are, according to pretty much everyone except me, completely useless. They are also probably two of the oldest wethers on the planet. During her last visit to the farm, my mother pointed at Chip and Chip and said, "Tell me again why you don't eat those two." I reminded her that for one thing, they were much too old and wouldn't taste very good. And secondly, it would be like eating the dog. "Oh." Since sheep are always standing on all four of their feet, they cannot give each other hugs like people can. 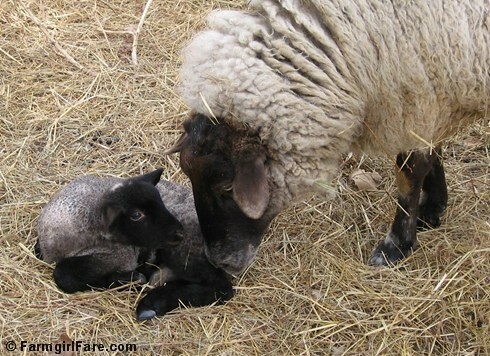 A mother ewe is unable to hold her lamb; the lamb snuggles up next to her or will sometimes sit right on top of her (which is adorable). To show affection in general, sheep have their own unique version of a hug, which I learned from Big Chip. What you do is this: Stand right next to the sheep, knees slightly bent to brace yourself. Then you lean your hip and leg into the sheep, pressing with all of your might. At the same time, the sheep presses back. If you stop hugging before the sheep is done, you will end up on the ground. Other than that, it's a very pleasant experience. Every time I get near Big Chip he walks right up to me and demands a hug. Besides being fun to have around, the Chippers actually do serve a purpose, which I am constantly called upon to explain to people when I am rationalizing their existence. If you want a flock of sheep to do something or go somewhere, you only need to get one sheep to do it. Then the rest will generally follow along (hence all those sheep jokes). A Chipper is often The One. Because they're so friendly and trusting, it's much easier to get them to do what you want than, say, a psychopathic ewe who always looks as though she wants to kill you (and has, on more than one occasion, tried to). If we're trimming hooves or shearing, I can usually walk right up and put my arms around one of The Chippers and we're good to go. If this priceless attribute is not a reasonable enough explanation, I then point out that I do not have any children, so my animals are my kids, and a wether is even easier and cheaper to keep than a dog (let alone a small child). I've also managed to keep another pet wether around—a 250+ pound baby named Sweet Pea, but he's a whole other story. And since these three guys are getting grey around their muzzles, I have Teddy, my orphaned bottle baby born last year, standing by as Wether-in-Waiting. I've completely ignored all suggestions to rename him Tasty because he really and truly, with all his little lamb heart, believes that I am his mother. Teddy will never move into somebody's freezer. While the number of chocolate chip wethers I can get away with having in the barn is severely limited, fortunately there is no end to the number of chocolate chip cookie recipes allowed to live in the house. I usually turn to the recipe I've been following since grade school and used to make at my little California bakery cafe (it's similar to this one), it's always nice to try something new. I've found that even the slightest change in a recipe can result in an entirely different cookie, which is always a perfect excuse to bake another batch. I recently came across this recipe in my files. In 1991, I was working, among other things, as a freelance graphic designer for a small publishing company. The office was located on the same property as the owner's residence, and a talented, friendly man named Greg was often around, doing various construction and repair jobs. Not only did he install the most beautiful Art Deco tile bathroom I've ever seen, but he also brought us poor slaving workers a batch of his homemade chocolate chip cookies. They were delicious and different from any I'd ever tasted, so naturally I begged him for the recipe. I still have the original version that he scribbled in pencil on the back of a page from a long lost graphic novel with some really bad dialogue. Secondly, he calls for 'one bag chocolate chips (a little less),' and I've always wondered if this is because he steals a handful of chips before pouring them into the batter. I know I always do, but I never thought to admit it in writing. I made enough changes to claim this recipe as my own, but it's definitely based on Greg's. These are big, soft, and chewy cookies with lots of vanilla flavor and a crisp, buttery edge. They're a pleasant change from other chocolate chip cookies, and with the whole wheat flour and raisins in them, you can almost convince yourself they're good for you. But then again, some of us believe that all chocolate chip cookies are good for you. 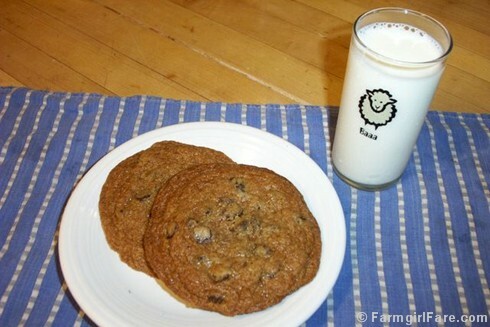 Who can resist homemade cookies and milk? These cookies are soft and chewy with lots of vanilla flavor, a hint of cinnamon and nutmeg, and a crisp, buttery edge. The chocolate chips and raisins taste great together (although you can skip the raisins if you prefer), and the whole wheat flour adds to the flavor and texture without making them taste like health food. In fact, you don't even need to tell anyone they're whole wheat. Everybody loves these cookies, but men go especially crazy for them. I gave a stack to our farrier and his son once when they were down here trimming donkey hooves, and a year later they were still talking about them. As always, I urge you to seek out local and organic ingredients; they really do make a difference. Organic raisins are are one of the best organic buys around. Organic flours and organic sugars are readily available these days. Look for real farm eggs like these at your local farmers' market or find a local source on LocalHarvest.org. You won't believe how good they taste. Grating your own whole nutmeg takes a few seconds and makes such a difference, plus you get to use one of those cute little nutmeg graters. I highly recommend investing in a couple of heavy duty commercial rimmed baking sheets; at about $15 each, they're one of the best kitchen deals around. Treat them well—I usually line mine with sheets of unbleached parchment paper, which is wonderful stuff—and they'll last for ages. I've been using the heck out of some of mine for 20 years for everything from baking scones to roasting Brussels sprouts. It's easy to make nice round cookies if you portion out the dough with a scoop. I own five or six different sizes and have had some of them for 20 years, too. For these cookies, I use a 1/4-cup scoop. Heat the oven to 350 degrees. In a large bowl, cream the butter, light brown sugar, and granulated sugar for about 2 minutes. (I use an electric hand mixer.) Add the eggs and vanilla and mix until well combined. Combine the whole wheat flour, all-purpose flour, baking soda, salt, cinnamon, and nutmeg, then slowly add the flour mixture to the butter mixture, beating on low speed just until well combined. Stir in the chocolate chips and raisins. The dough will be soft, and the cookies will spread while baking. For slightly thicker cookies, chill the dough for about 30 minutes. Bake at 350 degrees until the centers are barely set, about 16 minutes. You can also make smaller cookies; just reduce baking time. Cool on a wire rack. Serve warm or at room temperature with glasses of very cold milk. Personally I think they taste even better the second day. And, as with all chocolate chip cookies, they freeze beautifully. Can't survive on just chocolate chip cookies? You'll find links to all my sweet and savory Less Fuss, More Flavor recipes in the Farmgirl Fare Recipe Index. 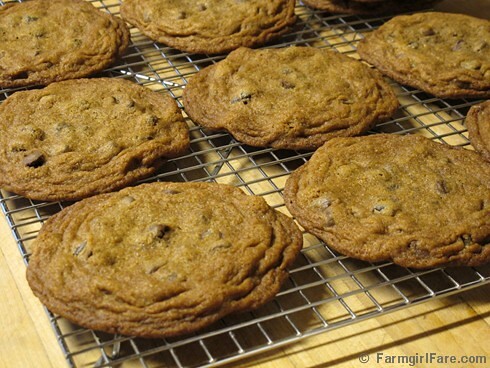 © FarmgirlFare.com, serving up recipes, stories, and photos from my crazy country life on 240 remote Missouri acres, with a stash of homemade chocolate chip cookies in the freezer. I think I had better have breakfast! I loved the story about your wethers esp since I thought teddy was soo cute yesterday. Great story. I personally think that it's natural to become attached to animals - or other people that we have a lot of contact with - once in a while. And that it's not a bad thing either! Those cookies look good, but not as cute as Teddy. The cookies look great too, what a great idea to use whole wheat flour! I loved reading this and the recipe sounds great. I do most of my baking with whole-wheat flour so the cookies sound right up my alley! Thanks everybody! I'm so glad you enjoyed the story. Clare & Nic: Yep, Teddy is a little charmer. 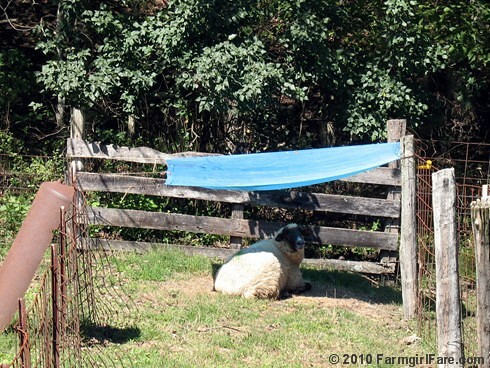 When a ewe has a lamb, she always calls to it using her unique "voice." Some have loud BAAAAAAs and others make low, rumbling sounds. Each lamb recognizes its "name." Since Teddy thinks I am his mother, he comes when I call "Teddy." And my other bottle lamb, Annie, knows her name, too. It's really cute. Anne: Sheep hugging is just a riot. I don't think many people know about it. I heard a story of a guy around here who, for some reason, bought one lamb at an auction. Sheep cannot stand being alone, so he let it ride in the front seat of the pickup truck with him. All the way home, he couldn't figure out why this sheep kept leaning up against him while he was trying to drive. Sheep hug! Amy: You can use all whole wheat flour in this recipe if you prefer. Greg's version called for 2 cups w/w pastry flour (no all-purpose), which I thought made the dough too soft. You can definitely play around with it. Adding an extra 1/2 cup whole wheat flour (2 1/2 cups flour total) will give you a thicker, cakier, slightly less rich cookie. Enjoy! Hi Susan, Just found your site and love your writing style. Keep it up! Any quail on the place? Would love to see a photo some time - I know, that won't be so easy. Welcome! Glad you found me. I do see quail once in a while. There used to be a lot more in the area. I think maybe people ate them all. It is certainly a (visual) treat to come upon a covey of them. But you're right; a decent picture wouldn't be easy. You never know, though. Thanks for commenting. Yummy!!! Cannot wait to make some of these. It's been way too long. After, of course I make some doggie biscuits! I made these cookies a couple of days ago and they were really nice but really crunchy and crumbly. I think I used too much butter. I have a set of cups but, being English, I am more used to ounces or even, if I have to, grams. Farmgirl do you have any idea how much weight of butter is in your cup? I looked up a conversion table and it said 1 cup butter would be 240 grams (which is a whole pack of butter in England) so that was what I used but the cookies sort of fried. Anyway, they were nice enough for me to want to make them again! I'm so happy you tried making these cookies--and haven't given up on them despite the results. Hmmmm. Crunchy & crumbly doesn't sound right. Mine are usually very soft and not very crunchy. One pound=454 grams, so 250 grams wasn't very much extra butter. Hmmmm. I am wondering about the sugar. I think you may have different types of sugar in England. Our "brown sugar" is soft and fine. If you used demerera or raw sugar (which are much coarser), you will have a much different result. Same with the granulated (white) sugar. Ours is about the consistency of table salt. Any sugar (even U.S. white sugar) can be put in a blender or food processor and made finer. In fact, I read that doing this will improve any cookie recipe--I just keep forgetting to try it! The only other thing that would make them very crunchy is the baking time. A shorter baking time will generally give you a softer cookie. Other than that, I'm not sure what else to suggest. At least they were edible! : ) Looking forward to hearing about the next batch. Thanks for the comment and for visiting. Happy baking! I have just made (and started eating) my second attempt at these cookies and this time they are perfect! Soft in the middle, a little crunchy around the edges (I think my oven is uneven) but such a wonderful taste. I am not sure what I did differently - maybe just paid more attention, but I am so pleased with the results. Congratulations on your cookie success! They do sound perfect. Thanks for taking the time to write me about them. Yes, next you'll have to try the Crazy Cookies! They are completely different than these. I love the sheep glass. Did your mom give you that? I'm a little late answering your question, LOL. Nope, that glass is actually one of the few sheep things in the house that my mom isn't responsible for. It was a gift from a friend (along with a couple of others), and I just love it. Great post and love your writing style! Am very glad I found your blog. Great story and great cookies! I have a batch in the oven right now. One of the best whole wheat chocolate chip cookie recipes out there!!! I love the Baa glass. Where did you find these? So cute. Hi Farmgirl. I've been reading your blog for over a year now, I think, and have wanted to make these for just as long. I finally did and... they're amazing, really. I'm not a sweets fan, but these things should be illegal or something. They're just too good. I'm game for referring to them as the "healthy cc cookie". Hey, they have wheat flour in them for Pete's sake people. Yep, I followed your recipe exactly. Anyway, I just wanted you to know that I'm making them for Christmas presents for neighbors and family... thanks to your wonderful recipe and posts ! Thanks Farmgirl. Just finding your choc chip cookie recipe...5 years after you wrote it. Better late than never. I was wondering what ever happened to The Chippers? 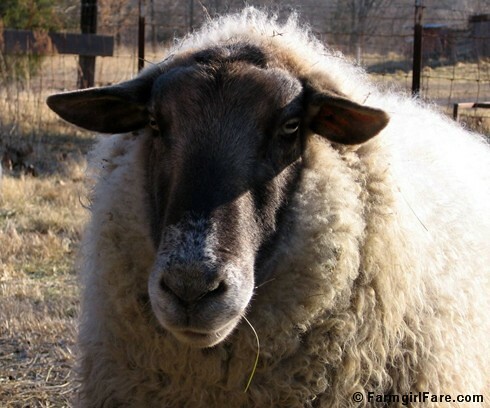 We keep a wether (Filbert) as a man-friend for our ram Buckeye. Keeps the testosterone levels at an even keel and 'Bert's fleece is beautiful.